In this issue of the Blood-Letter: a preview of our November Bloody Thursday guest Lou Berney, award results, international titles, and more! 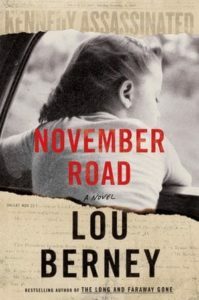 Friends of Mystery is pleased to welcome Lou Berney as our November speaker. Lou is the author of The Long and Faraway Gone (winner of the Edgar, Anthony, Barry, Macavity and ALA awards), Whiplash River, and Gutshot Straight. 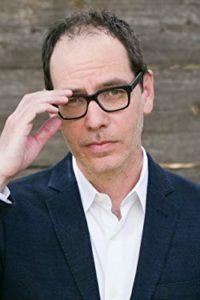 He’s also written a collection of stories, The Road to Bobby Joe, and his short fiction has appeared in publications such as The New Yorker, Ploughshares, and the Pushcart Prize anthology. He teaches in the MFA program at Oklahoma City University. “My two older sisters liked to play school with me, whether I liked it or not, and so I learned to read, whether I liked it or not, at a very early age. Lawrence Kasdan (The Big Chill), who acquired rights to the book in a six-figure deal, is already slated to adapt Road into a movie. We hope to have copies of the book available for sale at the meeting. Please join us at TaborSpace, 5441 SE Belmont St., Portland, Oregon 97215. The event is free and open to the public. A social time with refreshments begins at 7:00 pm, with the program beginning at 7:30 pm. Free parking is available in the block across from the entrance. Bus line #15 will drop you off right by the door. If you liked Jane Harper, you may want to try Emma Viskic. 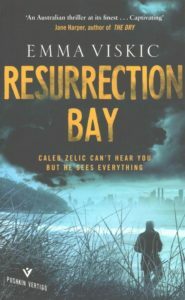 Her debut novel, Resurrection Bay, won the 2016 Ned Kelly Award for Best Debut, as well as an unprecedented three Davitt Awards: Best Adult Novel, Best Debut, and Readers’ Choice. Her main character, Caleb, is deaf, and she studied Australian sign language (Auslan) in order to be able to write him. Her next novel featuring Caleb, And Fire Came Down, is available now in the U.S. In the wake of her husband, Bram’s, infidelity, Fiona Lawson manages to keep her sons’ lives as stable as possible, thanks to a bird’s nest custody agreement. The two boys get to stay in their home, while Fiona and Bram take turns living there. 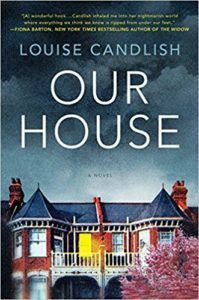 All seems to be going as well as possible until the terrible day Fiona arrives at the house to find her family’s possessions gone – and strangers moving in. Twenty-six-year-old Cat Kinsella overcame a troubled childhood to become a detective constable with the Metropolitan Police Force, but she’s never been able to banish the ghosts of her past or reconcile with her estranged father. Work provides a refuge from her family dysfunction, but she relies on a caustic wit to hide her vulnerability from her colleagues. 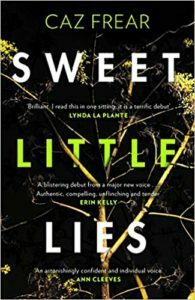 When a mysterious phone call links a recent strangling victim to Maryanne Doyle, a teenage girl who went missing in Ireland eighteen years earlier, the news is discomfiting for Cat. Though she was only a child when her family met Maryanne on a family vacation, right before she vanished, Cat knew that her charming but dissolute father wasn’t telling the truth when he denied knowing anything about the girl’s disappearance. Did he do something to Maryanne all those years ago? Could he have something to do with her current case? With the new season underway, it is time to consider renewing your membership. Dues are $20.00 annually. FOM is a 501 (c) (3) non-profit organization. Dues and additional donations are deductible to the full extent of the law. Please mail your check, made out to Friends of Mystery, to PO Box 8251, Portland, Oregon 97202. Your newsletter will be sent electronically unless otherwise requested. The news must be related to mystery or true crime writing, films, and television, as well as non-fiction examinations of the mystery genre. Friends of Mystery will not be able to edit announcements, and will publish them as provided. Friends of Mystery will include one image with each announcement, if provided. Friends of Mystery is not responsible for the content of news announcements, and we reserve the right to not publish any announcements which we feel will reflect poorly on the organization and do not advance the organization’s mission. Members and readers are encouraged to submit book or film reviews, comments on authors, and recommendations for books to read or questions about mysteries, crime fiction and fact. If you have suggestions of mysteries worth sharing, please contact the editor at: jvoss@spiretech.com.